warning: Parameter 1 to phptemplate_field() expected to be a reference, value given in /home/jeremydia/sites/newyorkunderbelly.com/www/includes/theme.inc on line 170. "Aerodrone draws you into a world of Converse, Seven Brand Jeans, and SuperCuts while never letting go with its poppy synth-driven energetic hooks and tounge-in-cheek lyrics that dig in deeper than your familiar current electro pop-fluff band. 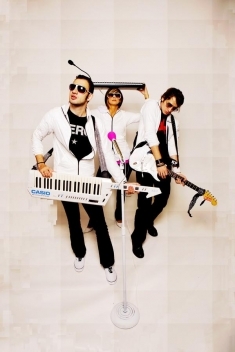 The group's single "Sceneboy" has spawned a Youtube following and has been described by the Knitting Factory in Hollywood as "destined for great things, at least the conquering of all iPods in the free world." The band has been gigging relentlessly through 2008 both nationally and regionally and has gotten Featured Artist Spot on the social giant Myspace.com, MTVU's Band Of The Week as well as top reviews from sites like AbsolutePunk.net."